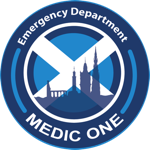 We are now welcoming further applications for LAT posts in Emergency Medicine within NHS Lothian. Newer PostWednesday's #LearnED Meeting- All welcome! Older PostMerry Christmas to our amazing team and all who support us!